Will $17,995 for an ‘84 Volvo 240 Turbo pass your moose test? Turbobricks.org was a site that was all about the fast Volvos. It's pretty much gone, but today's Nice Price or Crack Pipe Turbo 242 is still here, and at a price that could mean it may not be going fast. Yesterday's 1978 Seville lacked its contemporary brethren's Raphaelesque proportions. And possibly because of that, 60% of you ascribed to the tenet that if it's not baroque, don't fix it - or buy it at least - sending that Caddy off with a Crack Pipe loss. It may have been the slab-sided boxy styling, or its less than classy base made evident when you peeled back the thin veneer of Cadillac-ness. Or maybe it was the wide tufted leather seats that drove that vote? Today's car, however, should fare differently because it possesses none of those attribu. . . aww, crap! 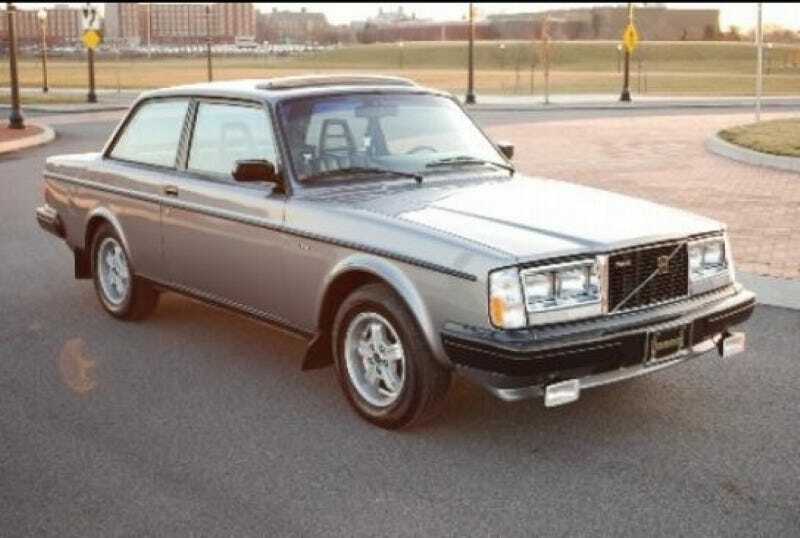 Okay, much like yesterday's Seville, this 1984 Volvo 240 GLT Turbo is boxy, is an up-scale version of a basic car, and sports tufted leather seats that were designed for Swedish asses that had been wrapped in thick winter clothes. That being said, it differs in rocking a turbocharged and intercooled four instead of a lumbering pushrod eight. Its transmission has five gears instead of three, and you'll need to help them move from one to another. And, it's a Volvo, which is spelled totally differently than Cadillac. Now that we've gotten that settled, lets have a look at this silver Swede. You know, Volvo has never had the kind of money that a company like Ford or Toyota can toss around. And that has meant that, over the years, they couldn't spring for all-new motors every time the competition came out with a new eight, or five, or something that would require me to take off my shoes to count. So at a fateful meeting in the mid-'70s, at their Gothenburg headquarters, Volvo's head engineer addressed the board of directors with his brilliant solution to maintaining horsepower parity without the cost of newer and bigger motors. Shuffling his notes, and clearing his throat, he held the board's total, rapt attention, as they knew this was life or death for the brand. The engineer, however, was unsure how they would react. He took a deep breath, addressed each with a respectful nod, and spoke clearly and with authority - yorgdy, vorgdy, vorgdy, ikea, vorgdy, yorgdy, moose turd pie, vorgdy, vorgdy. For those of you who don't speak Swedish, what he suggested was that turbocharging the company's anvil-like Red Block four would be a cost effective way to compete. This ‘84 is like a time capsule - or, the metal box that a time capsule might come in. The 2,127-cc four under the wide expanse of hood sports both a turbo and air to air intercooler. It also comes with Bosch K-Jetronic fuel injection and a single overhead cam. In this guise the B21FT-IBS motor puts out 160-bhp, and identifies this car as an ‘84.5 model. Backing up the rabid Red Block is an M46 5-speed stick, which is livin' Levitra-loca in front of an overly plasticy dash, which has been pocked with additional gauges. Also facing that plastic fantasic is the pair of aforementioned seats which are leather bound, and - being Volvo seats - will probably improve your posture. Outside, the car looks to be in awesome shape, lacking the typical blemishes of COEXIST bumper stickers and Apple logos on the glass. The paint appears clean and shiny, even below the gas filler door where years of incontinent dribbling typically leaves an oily trail. Even the exhaust pipe is the appropriate snaking stainless pipe rather than the disappointingly too common fart can you might expect. Despite its being immaculate in its conception, right down to the five spoke alloy rims, fog lamps, and sunroof air deflector, this car has a claimed 100K on its clock. If that seems like more than you'd expect given its condition, then so might its $17,995 asking price. Of course 100K on a 200-series Volvo is practically nothing, and so too might be considered that price. But that's up to you to determine, so what do you think, does $17,995 make this Volvo a value? Or, is that thinking waaaay outside the box? AutoTrader or go here if the ad disappears. H/T to Martin_Grundle for the hookup!